I want to create multiple copies of a video DVD. Can you tell me how to use DVD Author Plus for copying the discs? You can easily create multiple copies of a video DVD using DVD Author Plus. This is helpful for making backups of a disc. First you need to have DVD writer on your PC and a DVD that is capable of writing. To create copies of a video DVD, go to File >> Copy Disc. Insert the original disc into the drive. Select source and target drive. Make sure that the target drive has enough free space available to store your data. Then click the Copy button to create a copy. The file created with be an image of the DVD. 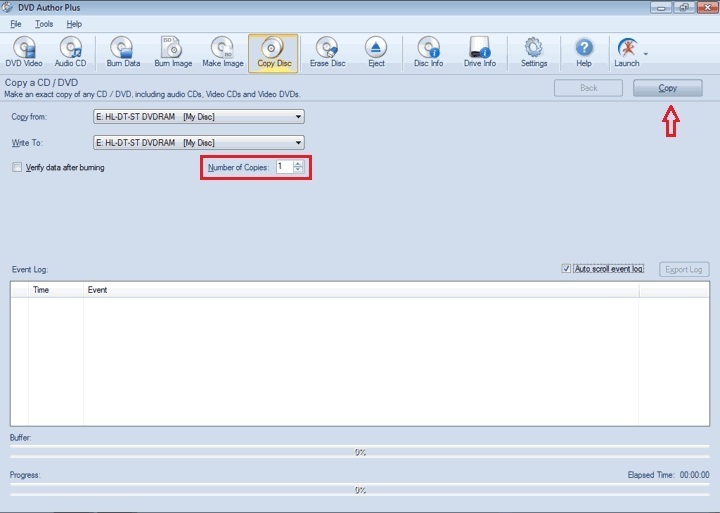 Once the file has been created, insert a new disc and create a copy of the original by writing the image file to it. If you are making multiple discs, increase the Number of Copies. You can see the status of the burning process in the Event Log.